The GoBat™ 2600 is extremely diverse with it's 3-in-1 capabilities. 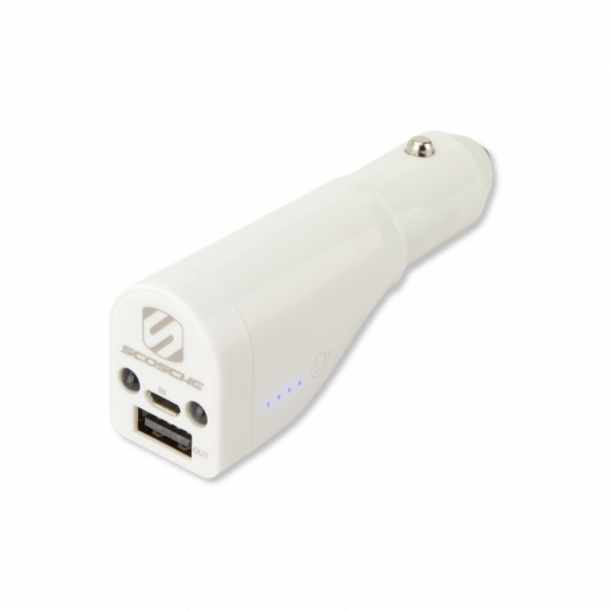 While primarily acting as a 7.5 Watt car charger for your mobile device, it can also be used as a portable power bank and a flashlight/safety strobe. Providing 7.5 Watts, your mobile device will charge at a fast rate. Not only does the GoBat™ 2600 charge your phone, but it will also charge itself at the same time. This will help void the never question on backup batteries, "Is the backup battery charged?". Arrived at your destination and still need to charge? This GoBat™ has a built in 2600mAh battery that charges itself when plugged into your vehicle*. Simply take the charger with you can get the juice flowing! Recharging the internal battery is also an option via micro-USB. Need some extra light? The charger has you covered. With dual LED's, you're provided with plenty of light to find your phone in the abyss under your seat, find the valve-stem on your tires or wherever you may need it. These LED's can also strobe to help grab attention in emergency, or safety situations. This unit also has a magnetic cap to mount the flashlight.